Sonoma State University is a beautiful campus with many different unique places. With all the students that attend it, sometimes it can be hard to find the best spot to study. The environment you’re studying in can often determine how well you’re able to concentrate and absorb the material you’re learning. According to Western Governors University, when looking for a place to study, you should consider if the area has good lighting, the right amount of background noise for you, is not too distracting and is a place you feel comfortable in. While the library offers wonderful resources such as CSU+, Subject Librarians and the 24/7 chat line, the library might not be the ideal place for you to study in or meet up for group projects. Everyone has their own tried-and-true study preferences, but whether you’re looking for a place to work with a group or need a new place to sprawl out and read your text books, there are spots on campus that are often overlooked and might just be the right fit for your needs. A quiet study space on the inside the Wine Spectator Learning Center. Sonoma State’s newest building has the perfect tables inside and outside the building,with outlets too for that moment when your computer is about to die. The center also has the perfect temperature. In some places, such as the library, it can get cold but in this spot you’re guaranteed to be comfortable. Also, don’t forget about the fact it’s a new building, with that comes a new code and fire protection. “I love studying at the wine business center because the new and improved infrastructure makes me feel more safe in case of a natural disaster,” said Lucas Pfeiffer, a Business Marketing major. The library isn’t the only place with study rooms. On the second floor of the student center there are multiple rooms you have the ability to rent out. To do so, you just go to the front desk of the student center and they’ll hold your student ID. These rooms not only have the ability to hold a number of individuals but the spaces also encompass projectors, tables, outlets and are a nicely lit space. The study room on the first floor of Stevenson on the North side of the building next to the School of Education. In the first floor of Stevenson there is a nice space which gives students a great environment to be able to concentrate. An advantage to this area is not a lot of people know about it so it’s usually never too crowded, giving you the ability to focus on your studies. The study area is a comfortable space, with both high tables and booths and easily accessible vending machines. “There’s a wide variety of snacks in the vending machines also, which I love. Make sure your laptop is charged though, there’s no outlets and I’d be lying if I said I didn’t unplug the vending machine once to charge my laptop…desperate times,” says Daniela Zarich, a Chemistry major. 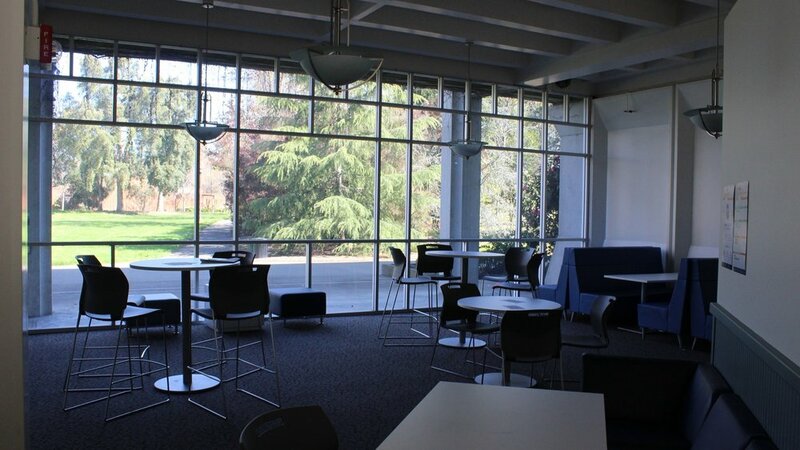 The Sonoma State Library is a great place to find a secluded study spot. As we’re entering spring, it’s getting nicer out. Meaning students now have the ability to soak up the sun while doing homework without looking like they just took a shower in the rain. When you walk up the stairs to the third floor of the library and turn left, if you continue walking there will be a patio located on your right. With three tables and two benches, this would be an ideal place to read for class or to meet with groups. 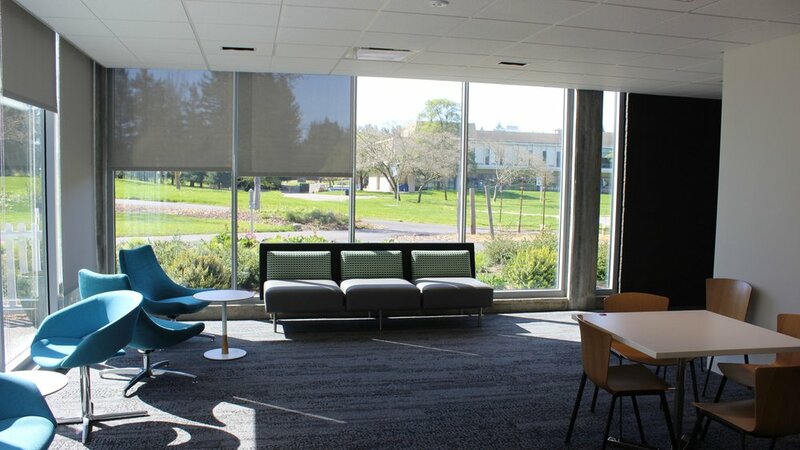 Also with shelves of books just inside, the outdoor seating area turns study time into relaxing time with a view of both Verdot and Zinfandel Village. Make sure to bring paper weights to prevent worksheets flying around on windy days. “I enjoy studying at the Student Center because of it’s inviting nature with the fireplace. It has the perfect mix of conversation around that doesn’t provide for too quiet of an environment.” said Nour Hamza, an Early Childhood Studies major. Students Brenden Gallardo and Tyee Stokman work together on the outside patio of Charlie Brown’s in McCabe Plaza. Although Charlie Brown’s is a widely known spot, it is still a great place to sit down and do some work. The patio and indoor areas geat crowded during lunch, so make sure to grab a spot early. The secluded tables in the back of the cafe are a great place to sit because if you get the munchies while doing work, you’ve got a whole cafe at your fingertips. “I like studying in Charlie Browns because it’s a good place to meet up with class members for group projects or just to simply study alone. This has honestly been my place since freshman year, it holds great memories,” said Juliana Wells, an Early Childhood Studies Major.